With an extra week off for the post-Christmas break, I decided to treat afternoon-tea-loving Ma Lee to one of the best in Birmingham. The Edgbaston is a boutique hotel (strangely enough in the suburb of Edgbaston) which has become almost as famous locally for its fabulous cocktails and decadent vintage style afternoon tea. From the moment you enter the stylish lobby and enter the Art Deco inspired cocktail lounge with huge chandeliers and gold embelishments you know you are in for a treat. Next was the showstopper – which is probably nice as a surprise but is impossible for any blogger not to mention. There’s a complementary amuse bouche. There’s dry ice. There’s a warning not to touch any remaining minus eighty degree rocks of ice if you want to keep your fingers intact. It’s quite magical and I defy you not to oooh and aaah. The palate cleansers were quite lovely too, some sort of whiskey infused cheesecake with edible violas. Time for the main event! A rack of savoury and sweet delights are served and we quickly set about demolishing the selection. In keeping with the festive theme, there’s turkey & cranberry served on a brioche bun, and a teeny tiny mince pie. There’s also smoked salmon & avocado on lemon bread, Wensleydale cheese and curry sauce (?) on a seeded cracker, the ever-present macarons (am I the only person that doesn’t really get the current macaron obsession?) and a melt-in-your-mouth passionfruit & meringue tart; before our final course of straight-from-the-oven plain and fruit scones with sealed jars of clotted cream and jam. Every bite was delicious and packed full of flavour, but it was the whole experience that made this afternoon tea a cut above the rest. The dainty porcelain; the amazingly polished teapots; efficient, friendly and knowledgeable staff; and a sophisticated and elegant setting. Just like me and Ma Lee. Our festive afternoon tea was £25 per person. 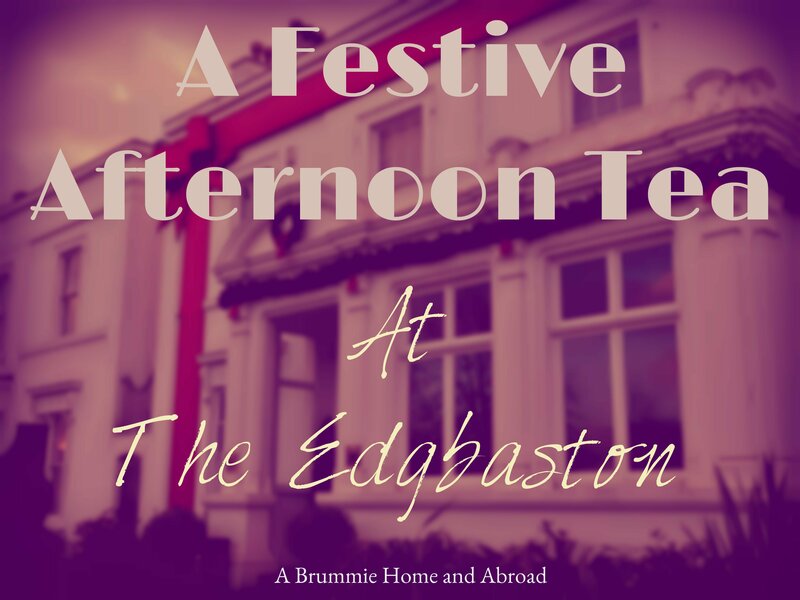 You can book in advance via The Edgbaston website. The Edgbaston, Highfield Road, Birmingham. "A Brummie Home and Abroad's Occasional Guide to Adulting: Wardrobe Decluttering"
"Sparkles and Sequins with the Strictly Come Dancing Live Tour!" Hi Chloe, It was such a lovely treat! I’m usually a “mug of builders tea” kind of gal so it was nice to have something a little different! This looks absolutely amazing! I really need to get this booked – maybe when my mum next comes to visit! Hi Claire, its definitely a lovely mum-daughter treat!